Da Nang (VNA) – Historical and cultural beauties of Vietnam and Japan are being showcased at a festival in the central city of Da Nang to bring the two peoples closer to each other. 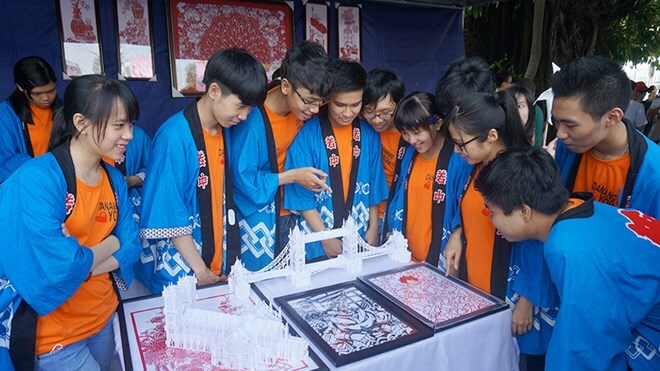 The third Vietnam – Japan cultural exchange festival, opened on July 29 at the Han River port, is among a series of activities to attract Japanese investment and promote the images of Japan and Da Nang. While Japan’s Kushiro and Nagasaki cities introduce their culinary identities, Mitsuke city offers visitors an insight into its kite making art. Tourist attractions in Yokohama, Narita and Sakai cities are also popularised at the annual event. Thanks to strong promotion, this year’s festival attracts the participation of more than 60 delegations from Japan, including 25 art troupes performing tea ceremony, Ikebana flower arrangement, calligraphy, singing and dancing. As part of the exchange, a workshop will provide visitors information about study and employment opportunities in Japan. It is held in coordination with over 15 universities and Japanese language schools from the country. A Japanese eloquence contest, film screening, singing competitions for Japanese businesses’ employees and Japanese language students, and a Kimono fashion show also form part of the festival.